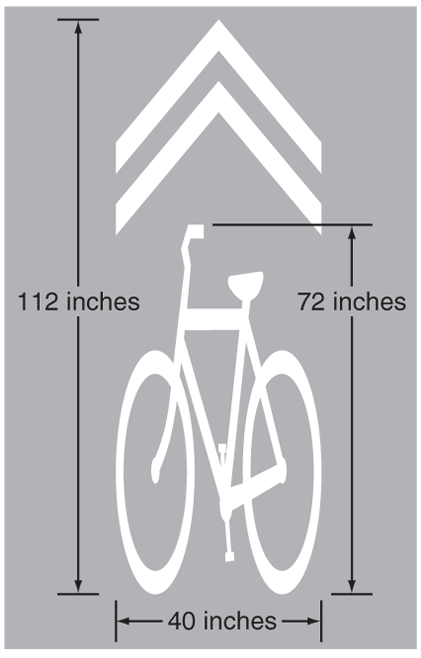 VDOT recently issued guidance on use of the Shared Lane Markings (sharrows) and Bicycles May Use Full Lane signs (BMUFL) in the Northern Virginia District. The formal title is BIKES MAY USE FULL LANE Signs and Shared Lane Markings, Northern Region Traffic Engineering Practice. It was written by Randy Dittberner, VDOT Traffic Engineer and dated April 10, 2012. The guidance is meant to clarify how the devices should be used in our area. This is an important step in the implementation of these devices. We've heard that both devices will be installed on a few roads in Fairfax in the coming weeks. There will also be publicity to inform the public about why the devices are being used and what they mean. Neither device shall be used on roadway segments with bike lanes, since a bike lane eliminates the need for these devices. Neither device shall be used on roadway segments with paved shoulders 4 feet or more in width. Although cyclists are permitted to use the travel lane even where shoulders are present, these devices may inappropriately discourage some cyclists from using the shoulder. Both devices should be limited to roadway segments designated by the local jurisdiction’s bicycle plan as part of its bicycle network. Roadway segments with low traffic volume, less than 3,000 vehicles per day, should not need these devices, because they usually offer a sufficient cycling environment. Neither device should be used on roadway segments with traffic volume greater than 30,000 vehicles per day or speed limits greater than 35 mph. Cyclists are generally permitted to use high-volume, high-speed roadways, but these devices may encourage novice cyclists to travel on a roadway above their skill level. Where this condition is the reason for installing the sign, its use should be limited to roadway segments where the combined width of the right-most travel lane and any paved shoulder is 10.5’ or less, excluding the gutter pan, if any. In order to avoid overuse of the signs that would reduce their impact and effectiveness, BIKES MAY USE FULL LANE signs should be limited to roadway segments used frequently by cyclists, or where cyclists report being intimidated by nearby motor vehicle traffic. We are a little concerned that the signs only be used on roads 10.5' or less. Most of the roads in Fairfax are 11' or greater. This guidance seems to greatly reduce the number of locations where the signs could be used. Shared Lane Markings can provide guidance where there is a gap in or a terminus of an otherwise continuous bike lane, where constraints such as roadway width preclude the addition or extension of a bike lane. Where on-street parking is permitted and frequently occupied, Shared Lane Markings can help cyclists choose an appropriate lane position, rather than riding too close to the doors of parked cars. Where a roadway segment is wide enough for a bike lane in only one direction, the bike lane can be installed in the uphill direction and Shared Lane Markings can be used in the downhill direction, where cyclists are more likely to travel near the speed of motorists and may need to ride farther from the curb to have enough reaction time. 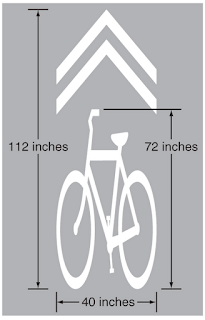 The layout of Shared Lane Markings shall not vary from the figure depicted above. When roadway segments with Shared Lane Markings are repaved, the segments should be evaluated to determine whether the pavement could be widened enough to mark a formal bike lane. Roadways with Shared Lane Markings should be a high priority for shoulder widening. If it is infeasible to widen the pavement, the segments should be evaluated to ensure that traffic and roadway geometric conditions continue to support the use of Shared Lane Markings. A BIKES MAY USE FULL LANE sign and a Shared Lane Marking should not normally be used on the same roadway segment, unless extreme conditions, such as a documented volume of heavy cyclist traffic and severe roadway geometry, are present to a degree that using both devices together would provide a significant additional benefit to the traveling public. I agree that it's unreasonable to limit BMUFL signs to locations with travel lanes narrower than 11 feet, since 11-foot to 13-foot travel lanes are clearly not safely sharable laterally between a bicyclist and any auto. Also, Arlington County has installed both sharrows and BMUFL signs in the same location with excellent results.